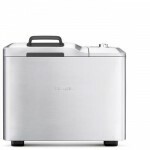 Finding the best bread maker for the modern user on the go is complicated by the fact that the field is littered with contenders. The whole point of using a bread maker is to have high quality bread with less time investment than making the bread by hand, so it’s a little counterproductive to use up a lot of time hunting for the best bread maker. To that end, I will run through a description of the features a modern bread maker is expected to have as well as provide a bread maker review of the 41300 Dual-blade bread maker from manufacturer West Bend. Reading product descriptions only goes so far. A good bread maker review is meant to provide an insight on the things that matter and helpful in making a purchase decision. Unless you are looking for a bread making machine, you’d probably haven’t heard of the West Bend brand. But don’t simply discount the West Bend 41300 before you have a good idea on what it has to offer. Scroll down and learn more on things that make West Bend a worthy consideration for your home baking investment. 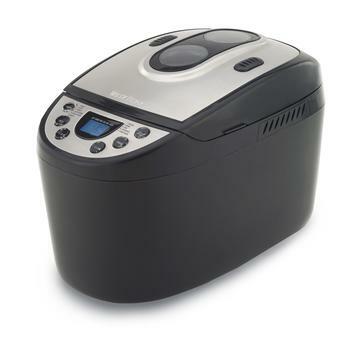 How Good is West Bend 41300 Bread Maker? Bread machines are much improved over their earliest incarnations, but the basic idea is the same. 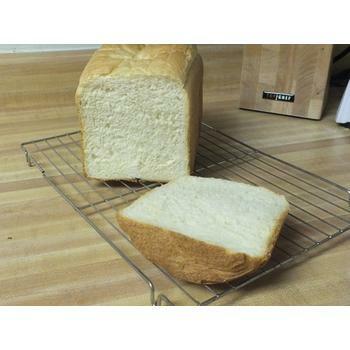 A user places the ingredients into the pan in a certain order, closes the lid, presses a few buttons, and then returns a few hours later to enjoy a freshly baked loaf of bread. The combination of convenience and quality has made bread makers a popular appliance, spurring competition in the field. Modern bread makers can make many different kinds of bread as well as dough and jam. The best bread maker needs to be able to stand out from the crowd, either by offering unique features or by producing particularly excellent bread. West Bend 41300 Hi-Rise dual-blad bread machine weighs 16 pounds. It measures a foot and a half in height, which is its largest dimension. 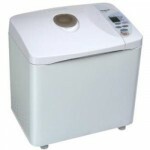 It’s a bulky machine, a little larger than the average bread maker. It is sharp black in color with a smooth form factor. 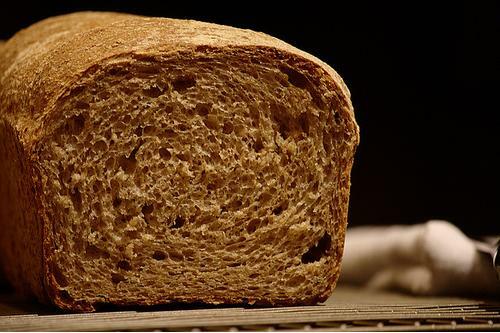 The West Bend 41300 definitely has more visual appeal than most other average bread machines. 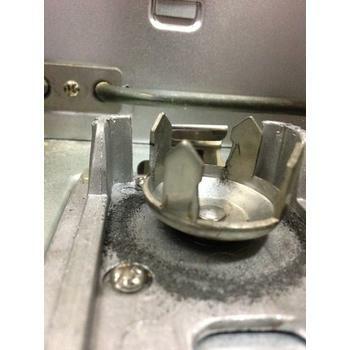 The machine is unusual in that it is a dual-blade model. Most bread makers work by having a swiveling blade in the bottom of the pan that acts as a mixer and kneader. The 41300 has two blades. Such design gives it additional reach and coverage in the pan. 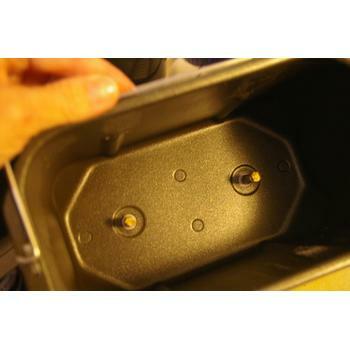 West Bend sells separately a two-loaf pan that can make use of the dual blades to make two loafs at once. This is a nice option that is virtually unheard of with other bread machines. Speaking of loaves, the 41300 offers a slightly larger than usual selection of loaf sizes. The industry standard is to offer 1 pound, 1.5 pound, and 2 pound loaf sizes, but the 41300 also has a 2.5 pound option. This gives the user a little more flexibility. Of course, the machine has a delay timer like all other bread machines, so it is possible to set the machine up overnight and have bread ready in the morning, or set it up in the morning so it can prepare bread for dinner. 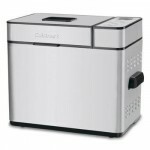 In terms of other unique features, the 41300 comes with a special tool that makes it easier to remove the blades from the loaf at the conclusion of baking, a perennial problem for even the best bread maker. It also lets the user set some custom directions for the baking process, which is a nice nod to advanced users. You’ve so far seen the good sides of West Bend 41300. But what could be the biggest consideration against it? Hardly, but there’s one thing that even the staunchest supporters of this machine would like to see improvement. If you like to add fruits and nuts into your bread, this maker from West Bend is really not well-designed. 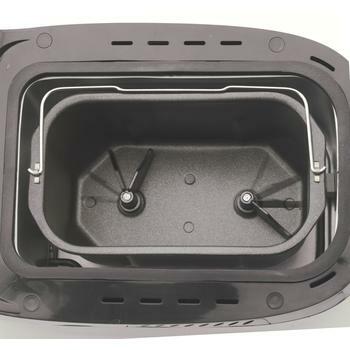 Expecting a seamless automatic fruits and nuts dispenser like that found in a Breville BBM800XL, is certainly not a fair one to make, given the price tag of the 41300. However, timing of the beep alarm (to indicate it is time to drop the nuts and fruits) could have been designed better. One common complain is the lack of clarity on when to drop in the nuts with some users complaining of too long a wait time. Is West Bend 41300 a Buy? Contrary to its lower priced sibling (West Bend 41400), West Bend 41300 offers a beautiful option for those looking for appliances that adroitly blend black and stainless steel touch. This is definitely not priced as an entry-level blender. Aside from the fruits and nuts issue, there is little to be desired for in a bread maker.